There are four components in an off grid energy systems, including solar panels, solar controllers, battery bank and solar inverters sometimes. 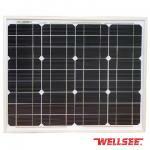 Solar panels are the most important component of a solar powered renewable energy system. A solar panel is basically several smaller “solar cells”. The number of cells that are used in a PV panel is dictated by what the desired voltage and wattage output of the panel is. When light from the sun makes contact with the solar cells in the solar panel, a process called photovoltaic effect produces electricity. In a nutshell, this photovoltaic effect occurs when PV cells are exposed to radiation from the sun. Solar power systems are typically constructed as 12, 24, 36, or 48 volt direct current (DC) systems depending upon the user’s energy requirements. In our small cabin, we get by fine with a 12 volt system but larger homes that require more power are usually best powered by one of the larger systems. When we first started using solar panels to power our cabin, we, like many people who were seeking out solar energy information, found ourselves asking the question; how much are solar panels going to cost us? We quickly learned that the answer to that question really depended on the size of the panel that we wanted to purchase. Solar panels come in various voltage ratings but there is another variable that you need to know about and that variable is the amount of power that one panel can actually produce. The easiest way to understand this concept is to think of the DC light bulbs that are used in your vehicles. All of the lights on your vehicle require 12 volts of DC electricity to power them but that is where the similarities end. For example, your headlights produce much more light than the dome light in your car and therefore they require more power. It’s likely that your headlights would require about 55 watts of power while your dome light probably only needs 5 to 10 watts. The more watts of a solar panel the higher the price will be. 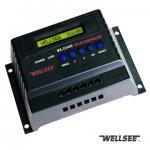 Your solar panels will be connected via wires to a device called a solar controller. 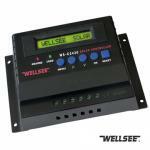 This device is designed to regulate how much power is allowed to flow into your battery bank. Without this device, your batteries could easy become overcharged and destroyed. The closer your battery bank gets to being fully charged, the less and less power the charge controller will let flow into it. When the battery bank is completely charged, this solar charging regulator will block any more power from going into the batteries. As you use the power that is stored in the batteries, the charge controller will sense that the voltage in the battery bank has dropped and once again allow power to flow and replenish the power that you have used. It’s true that any 12 volt battery can be used to store energy from a solar panel, in most applications, deep cycle lead acid batteries are used. I said “batteries” instead of “battery” because most applications require more than one battery to be wired together to make it possible to store enough power for the energy requirements of your home. Battery banks can be wired together in such a way that the voltage stays the same but the total amount of power (amp hours) they can store is increased. This is called wiring in parallel. Batteries can be also wired so that the voltage increases when more than one battery is wired together but he amount of energy that can be stored stays the same. This is called wiring in series. In most green power applications, a combination of series and parallel wiring is done to bring the voltage up the the required level and at the same time increase the total amount of power that a battery bank is able to store. Nearly all homes appliances in the United States are powered by 120 volt alternating current (120 VAC) electricity. It you want to plug your vacuum cleaner in and clean your carpet, you’ll need to plug it into a standard 120 VAC outlet. 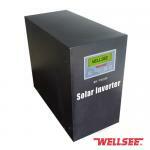 A solar inverter is a device that is connected between your battery bank and your home’s power distribution box. Its job is to take the DC power that is stored in your battery bank and increase it to 120 volts and at the same time change it from DC power to AC power. The other components of a solar powered home are various meters that will tell you things like how much power your system is currently producing as well as how much power is currently stored in your battery bank. Some of the other things they can tell you are how much power your system has produced over a certain length of time and how much power your home has consumed from your bank of batteries over a certain time period. Of course, all of these components need to be connected to each other via the proper gauges of wiring. Each component in the system should also be protected with adequately sized fuses to prevent them from being damaged in the event that a particular part of the system malfunctions. Most renewable energy systems will also have shut off switches that make it possible for the user to power down individual parts of the system when it becomes necessary to perform maintenance.